Welcome to the age of piracy! Gather your crew and set off on an exciting adventure! Meet Anne, the daughter of Captain Bluebeard. She will help you safely sail the seas without being attacked by sea monsters! 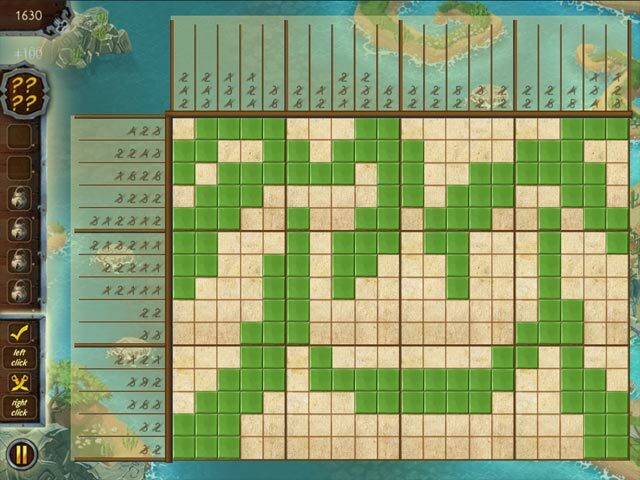 Solve fun nonogram puzzles on the high seas, protect yourself from monsters and find the hidden treasure! 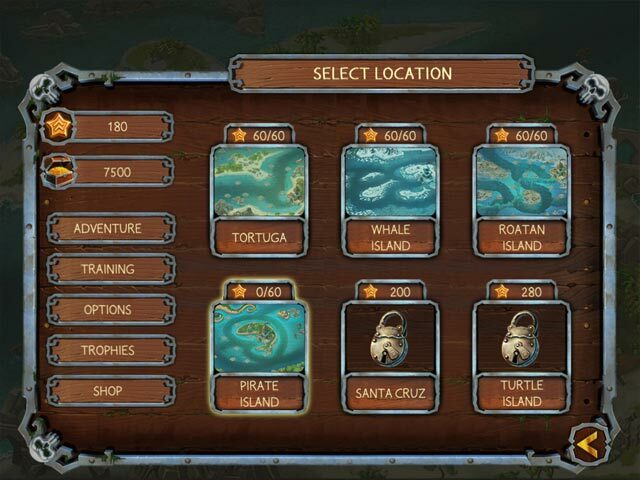 Explore six pirate islands and challenge yourself to 120 new and unique puzzles. Don't waste any time! Live the life of a courageous pirate right now! 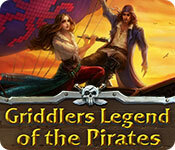 Griddlers Legend Of The Pirates is rated 2.8 out of 5 by 9. Rated 5 out of 5 by difficult1 from Challenging Thank goodness for these versions of mosaics. I love a challenge. No luck involved. Love it. I miss the option to automatically fill in a row that's done. And I can't wait for a new Gizmos. They are the best griddler games. But until the Gizmos resurface this is a decent filler. Rated 5 out of 5 by windsonged from I love logic games If you want to complete logic puzzles, you'll like this game. If you want something more, you won't. Just so you know what kind of thing I'm interested in, I still have my LSAT prep books and when I get bored I whip them out and knock out a few puzzles. I have absolutely no interest in a story when I play the logic games. I get them for the logic part. Puzzles don't have goal other than figure out the puzzle. If that's not enough for you, don't play the game. You'll hate it. The multicolor games can be a bit simpler. I consider many of them a cheat, although the nonograms like Malcolm and the Magnificent Pie actually still require logical thinking and make me use a different strategy for the game, so those ones are good. So, I don't mind in the least that this is monotone. Any one of these griddlers or nonograms that require guessing have me yelling "cheater" at the computer. Unlike some of those fancy story games for the griddlers, I don't have to deal with background images straining my eyes and making it impossible for me to see whether I've marked the square or not. My only complaint would be with the game description, which misleads you into thinking that there is going to be a story. Or a goal, other than "complete all puzzles without guessing." Just be honest. "This is a logic puzzle that has pirate themed images." That way people aren't disappointed because they expected something else. Rated 5 out of 5 by renatetoo from I just need to put my 2 cents in I've been playing this type of game for years. I love them, but only if they are totally logic-based. This is not a game that you play for a story line. It always frustrates me when there IS a story line, and I just want to get on with the puzzles. Story lines are great for hidden pictures, etc, but just waste time in puzzle games. I always do the tutorials, even though I know exactly how to play this type of game, because the designer may have added something new or changed something that I'd be happy to know about. If one of the previous reviewers had done the same, they would have noticed that it was stated over and over again that this one is based solely on LOGIC. As far as the single color is concerned, I don't mind that at all. Some of the multi-color games annoy me because by the time you get to the last color, there's no figuring at all: whatever spaces are left will be that color. So if you're just interested in playing puzzles, I recommend adding this to your games. You can decide for yourself if the number of puzzles offered is worth the cost for you. Rated 5 out of 5 by amminnc from A true griddler I much prefer this griddler game over the popular "mosaic" series for two reasons: 1st, this is a true griddler, a/k/a nonogram; it is based on logic and makes you think. 2nd, I'm a bit color blind so those multi-colored mosaics really give me a headache, plus they tend to be more fill-in rather than logic. I realize this may be boring for some, but if you are looking for a thinking game, this is it. Rated 1 out of 5 by verimeri from one color? Seriously? Who even outs out this kind of game anymore? All one color- no storyline-nothing to build. Really no reason to play it. I lasted for about 3 minutes in the trial play. Rated 1 out of 5 by pennmom36 from PICTURES LEAVE A LOT TO THE IMAGINATION Do you like army green? Good cause that's all ya get here. The good news is that these puzzles seem to be based upon logic, the bad news is that the puzzles are just boring. One thing I really hated was that they don't show a picture of the completed grid without the X's afterwards, or at least a title, you can see a tiny picture if you go back to the level map, but you need a really good imagination to "see" them. There are 6 Rooms with 20 grids in each room, and there are trophies to earn, probably one for endurance lol. You can earn up to 3 Stars per grid, a star is deducted for each mistake you make, but you can replay any level. With the coins you earn solving the griddlers, you can purchase items in the Shop, the right to make mistakes X 3, refill hints on this level or get 2 starting hints. Bottom line is, there is nothing special about this monochrome griddler, it's not colorful, the pictures are flat and difficult to see the end result. Rainbow Mosaics and Fantasy Mosaics have this one beat hands down! Rated 1 out of 5 by Limey2 from Pirates? They steal stuff In this case they stole my time. I'm sure I could have found something better to do with my time - laundry, vacuuming, etc. As one of the previous players said, the music was boring and only one colour? I know the mosaics with several colours can be just as boring, but at least they give something different to look at. This type of griddler might be okay for the absolute novice to learn how to do them, or as in the case of the player who is colour blind it won't give you a headache. (My husband is colour blind so I do sympathise). And the music was so bad I switched it off. This is one game I will not recommend - and I played the full demo just in case it might get better - it didn't. Rated 1 out of 5 by CyndiLouWho2 from Over one hundred levels of tedium Wow, over one hundred levels of boring one color grids, with no story-line, nothing to upgrade, nothing to build and nothing to strive for or accomplish. The music is monotonous and the graphics are truly sub-par. Yep, over one hundred levels, but I won't be the one playing them. Rated 1 out of 5 by Daxadillion from Dreadful I only played 6 grids before I became bored stiff with it, and the six I played were all in a dull green colour. The was no mention that it was based on logic and there was no auto fill. I didn't get to any Special Quests nor a Trophy which didn't bother me at all. The only good thing for this game is you get 1 Punch if you buy it. I am craving for a Penguin and/or Worlds Greatest Cities or Places game. 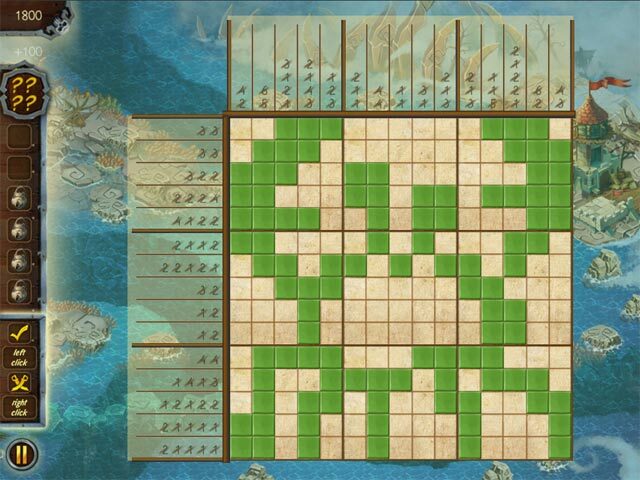 Have a blast completing 120 nonogram puzzles with pirate themes!